Protein kinase D (PKD) constitutes a novel family of serine/threonine protein kinases implicated in fundamental biological activities including cell proliferation, survival, migration, and immune responses. Activation of PKD in these cellular activities has been linked to many extracellular signals acting through antigen receptor engagement, receptor tyrosine kinases, as well as G protein-coupled receptors. In the latter case, it is generally believed that the Gα subunits of the Gq family are highly effective in mediating PKD activation, whereas little is known with regard to the ability of Gβγ dimers and other Gα subunits to stimulate PKD. 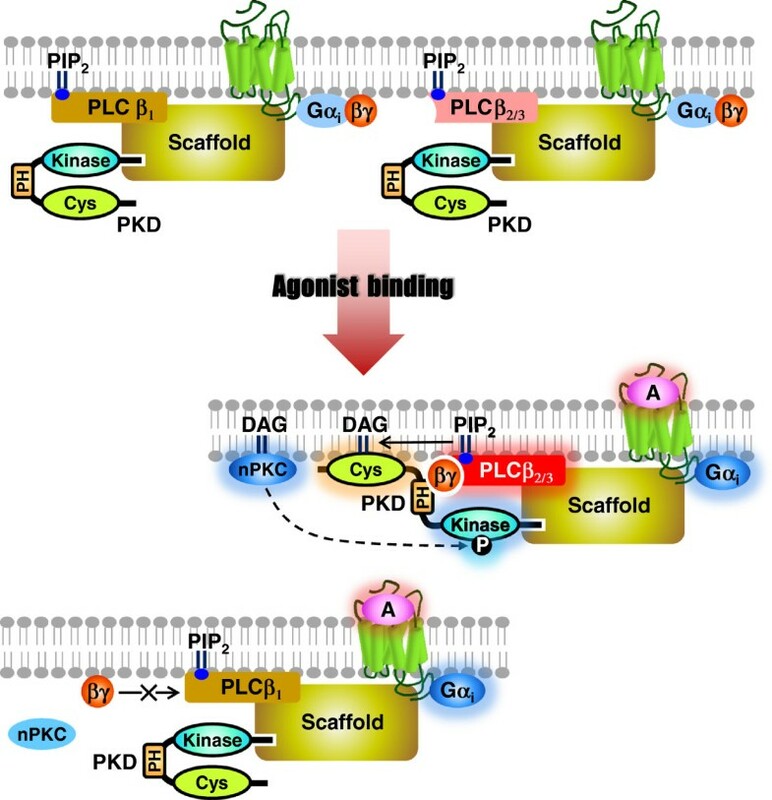 It has been suggested that the interaction between Gβγ and the PH domain of PKD, or the Gβγ-induced PLCβ/PKC activity is critical for the induction of PKD activation. However, the relative contribution of these two apparently independent events to Gβγ-mediated PKD activation has yet to be addressed. In this report, we demonstrate that among various members in the four G protein families, only the Gα subunits of the Gq family effectively activate all the three PKD isoforms (PKD1/2/3), while Gα subunits of other G protein families (Gs, Gi, and G12) are ineffective. Though the Gα subunits of Gi family are unable to stimulate PKD, receptors linked to Gi proteins are capable of triggering PKD activation in cell lines endogenously expressing (HeLa cells and Jurkat T-cells) or exogenously transfected with (HEK293 cells) Gβγ-sensitive PLCβ2/3 isoforms. This indicates that the Gi-mediated PKD activation is dependent on the released Gβγ dimers upon stimulation. Further investigation on individual Gβγ combinations (i.e. Gβ1 with Gγ1–13) revealed that, even if they can stimulate the PLCβ activity in a comparable manner, only those Gβ1γ dimers with γ2, γ3, γ4, γ5, γ7, and γ10 can serve as effective activators of PKD. We also demonstrated that Gi-mediated PKD activation is essential for the SDF-1α-induced chemotaxis on Jurkat T-cells. Our current report illustrates that Gβγ dimers from the Gi proteins may activate PKD in a PLCβ2/3-dependent manner, and the specific identities of Gγ components within Gβγ dimers may determine this stimulatory action. Protein kinase D (PKD) constitutes a novel family of diacylglycerol (DAG)-responsive serine/threonine protein kinases with different structural, enzymological and regulatory properties from the protein kinase C (PKC) family members [1–3]. To date, three members of the PKD family have been identified: human PKD1 (its mouse ortholog being PKCμ), and the more recently identified PKD2 and PKD3 (also named PKCν), among which PKD1 is the most extensively characterized isoform. Emerging studies have revealed that PKDs are implicated in a complex array of fundamental biological activities, including cell survival , migration , proliferation , and immune responses . In addition, growing evidence links PKDs to signal transduction pathways in tumor development and cancer progression. In many cases, specific PKD isoforms are dysregulated in cancer cells . All PKDs share a common modular structure, with a tandem repeat of zinc finger-like cysteine-rich motifs at their NH2 termini that display high affinity for DAG or phorbol ester, a pleckstrin homology domain (PH domain) for negative regulation of kinase activity , and a C-terminal catalytic domain containing transphosphorylation and autophosphorylation sites. Activation of PKD isoforms is generally attributed to phosphorylation at a pair of highly conserved serine residues (for human: Ser738 and Ser742 in PKD1; Ser706 and Ser710 in PKD2; Ser731 and Ser735 in PKD3) in the activation loop of the kinase domain by PKC. As PKC can be activated by many extracellular signals, stimulation of PKD isoforms has been demonstrated by antigen receptor engagement , stimulation of receptor tyrosine kinases (RTKs) such as platelet-derived growth factors (PDGF) receptors  and vascular endothelial growth factor (VEGF) receptors , as well as activation of various G protein-coupled receptors (GPCRs). Among the large GPCR family, receptors with preferential coupling to Gq, including those responsive to bombesin, vasopressin, endothelin, bradykinin , cholecystokinin , tachykinin  and angiotensin II have been demonstrated to activate PKD in a variety of cell types. Other G protein members like G12 and G13 have also been proposed to activate PKD3 in a PKC- and Rac-dependent manner . In addition, it has been reported that Gq, Gi and G12/13 may cooperate in LPA-induced PKD activation , but the relative contribution of specific G protein subunits (e.g. Gαi versus Gβγ) to PKD activation remains undefined. The functional specificity of G proteins was originally accredited to the Gα subunits, with the Gβγ dimers being viewed as negative regulators of G protein signaling. Yet, there is growing evidence that Gβγ dimers can also act as active mediators in signal transduction, thus conferring an additional level of signal specificity [18–20]. The Gβ identity in the Gβγ dimer imparts selectivity on its interaction with effectors like phospholipase Cβ , as well as in the regulation of neutrophil function . Moreover, since the Gγ component is structurally and expression-wise diverse, it imposes additional complexity in signal transduction. For instance, only certain Gβγ combinations (mainly those containing γ2, γ4, γ7 or γ9) are linked to significant STAT3 activation . Functional selectivity of Gγ subunits has also been reported [24–26]; deletion of the Gng3 gene leads to increased susceptibility to seizures in mice with significant reductions in Gβ2 and Gαi3 subunit levels in certain brain regions , whereas knock-out of the Gng7 gene is associated with reductions in the Gαolf subunit content and adenylyl cyclase activity of the murine striatum . These observations demonstrate that members of the Gγ subunit family are not functionally interchangeable. It has been suggested that the interaction between Gβγ and the PH domain of PKD , or the Gβγ-induced PLCβ/PKC activity is critical for the induction of PKD activation .However, the relative contribution of these two apparently independent events to Gβγ-mediated PKD activation has yet to be addressed. Recently, Gβγ combinations containing Gγ2 (i.e. Gβ1γ2 and Gβ3γ2) have been shown to be effective activators for PKD , but the relevant capabilities of other Gβγ dimers remain unclear. In this report, we demonstrated that all family members of the Gq subfamily (Gq, G11, G14, and G16) can induce PKD1, PKD2 and PKD3 activation. Gs cannot elicit a PKD response, whereas Gi members may induce PKD activation in a Gβγ-dependent manner. For the Gβγ-induced PKD activation, even in the presence of PLCβ2 or PLCβ3, only certain Gβγ dimer combinations are capable of activating the kinase effectively. Moreover, we showed that this selective Gβγ dimer-mediated PKD activation is accompanied by enhanced interaction between the two components when PLCβ2/3 is present. HEK293 and Jurkat T-cells were obtained from American Type Culture Collection (Rockville, MD). Pertussis toxin (PTX) was purchased from List Biological Laboratories (Campbell, CA). Cell culture reagents including Dulbecco’s phosphate-buffered saline (PBS), trypsin, fetal bovine serum (FBS), penicillin-streptomycin mixture, RPMI 1640 medium, minimum essential medium (MEM), Dulbecco’s modified Eagle’s medium (DMEM) and Lipofectamine PLUS™ were obtained from Invitrogen (Carlsbad, CA). The cDNAs encoding PLCβ1, PLCβ2 and PLCβ3 were obtained from Dr. Richard Ye (University of Illinois at Chicago). Flag-tagged human Gβ1 and Gβ2, HA-tagged human Gγ1, Gγ2, Gγ3, Gγ4, Gγ5, Gγ7, Gγ8, Gγ9, Gγ10, Gγ11, Gγ12 and Gγ13 cDNA constructs were obtained from UMR cDNA Resource Center (Rolla, MO). Antiserum including anti-Flag and anti-HA were purchased from Roche Molecular Biochemicals (Indianapolis, IN). Cell culture reagents including Lipofectamine Plus™ were obtained from Invitrogen (Carlsbad, CA). Myo-[3H] inositol was purchased from DuPont NEN (Boston, MA). M2 affinity gels and protein A-agarose were obtained from Sigma (St. Louis, MO). HA-PKD1 and FLAG-PKD2 constructs were gifts from Dr. J. Van Lint (Katholieke Universiteit Leuven, Belgium), and Myc-PKD3 constructs were kindly provided by Dr. Q. J. Wang (University of Pittsburgh, PA). HEK293 cells were cultured in MEM supplemented with 10% (v/v) FBS, 50 units/ml penicillin, and 50 μg/ml streptomycin. Jurkat T-cells were cultured in RPMI1640 containing 10% (v/v) FBS. For PLC assays and co-immunoprecipitation assays, HEK293 cells were seeded at 60% confluency into 12-well plates or 6-well plates, respectively. Transfection was performed on the following day using Lipofectamine PLUS™ reagents. For the establishment of stable cell lines (293/BK2R, 293/β2AR and 293/fMLPR), exponentially growing HEK293 cells were transfected with cDNA of BK2R, β2AR or fMLPR in pcDNA3.1-zeo using Lipofectamine PLUS™. The cells were then selected with Zeocin (50 μg/mL). 293/fMLPR-Gα16 cells were established by transient transfection of 293/fMLPR stable cell lines with Gα16 in pcDNA3. Twenty-four hours after transfection, HEK293 cells were serum-starved overnight and then treated with 500 μl (per well) of ice-cold detergent-containing lysis buffer (50 mM Tris–HCl, pH 7.5, 100 mM NaCl, 5 mM EDTA, 40 mM Na4P2O7, 1% Triton X-100, 1 mM dithiothreitol, 200 μM Na3VO4, 100 μM phenylmethylsulfonyl fluoride, 2 μg/ml leupeptin, 4 μg/ml aprotinin, and 0.7 μg/ml pepstatin). Lysates obtained were subjected to in vitro PKD kinase assay. Fifty μl of each supernatant was used for the detection of PKD isoform expression and stimulatory phosphorylation, and the remaining lysate (450 μl) was incubated overnight at 4°C with specific affinity gels to immune-precipitate the corresponding PKD isoform (anti-HA for HA-PKD1; anti-FLAG for FLAG-PKD2; and anti-Myc for Myc-PKD3). The resulting immunoprecipitates were washed twice with lysis buffer and twice with kinase assay buffer (30 mM Tris–HCl, pH 7.4, 10 mM MgCl, and 1 mM DTT). Washed immunoprecipitates were resuspended in 40 μl of kinase assay buffer containing 2.5 mg/ml of Syntide-2 (PLARTLSVAGLPGKK), and the kinase reactions were initiated by the addition of 10 μl of ATP buffer containing 1 μCi of [γ-32P]-ATP per sample. After 10-min incubation at 30°C with occasional shaking, the reactions were terminated by adding 100 μl of 75 mM H3PO4 and spotting 75 μl of the reaction mix onto P-81 phosphocellulose paper. Free [γ-32P]-ATP was separated from the labelled substrate by washing the P-81 paper four times (5 min each) in 75 mM H3PO4. The papers were dried and the radioactivity incorporated into Syntide-2 was determined by scintillation counting. The knock down of PKD1, PKD2 and PKD3 was performed by introducing the corresponding PKD isoform-specific siRNA from Invitrogen (Carlsbad, CA, USA) using Nucleofector® Kit V from Lonza (Basel, Switzerland). Briefly, 1×106 cells per sample were resuspended in Nucleofector® Solution and supplement provided at room temperature. siRNA against PKD1, PKD2 or PKD3 (200 pmol each) was added to the samples and then electroporated using the Nucleofector®. Electroporated cells were then incubated at room temperature for 10 min before transferring them into the 12-well plate with culture medium. The knock down of PLCβ1, PLCβ2 and PLCβ3 was performed in similar manner, with the corresponding isoform-specific siRNA obtained from Santa Cruz Biotechnology (Santa Cruz, CA, USA). Cells in 12-well plate were lysed in 300 μl of ice-cold lysis buffer (50 mM Tris–HCl, pH 7.5, 100 mM NaCl, 5 mM EDTA, 40 mM NaP2O7, 1% Triton X-100, 1 mM dithiothreitol, 200 μM Na3VO4, 100 μM phenylmethylsulfonyl fluoride, 2 μg/ml leupeptin, 4 μg/ml aprotinin and 0.7 μg/ml pepstatin). Clarified lysates were resolved on 1 μ2% SDS-polyacrylamide gels and then transferred to nitrocellulose membranes (Westborough, MA). 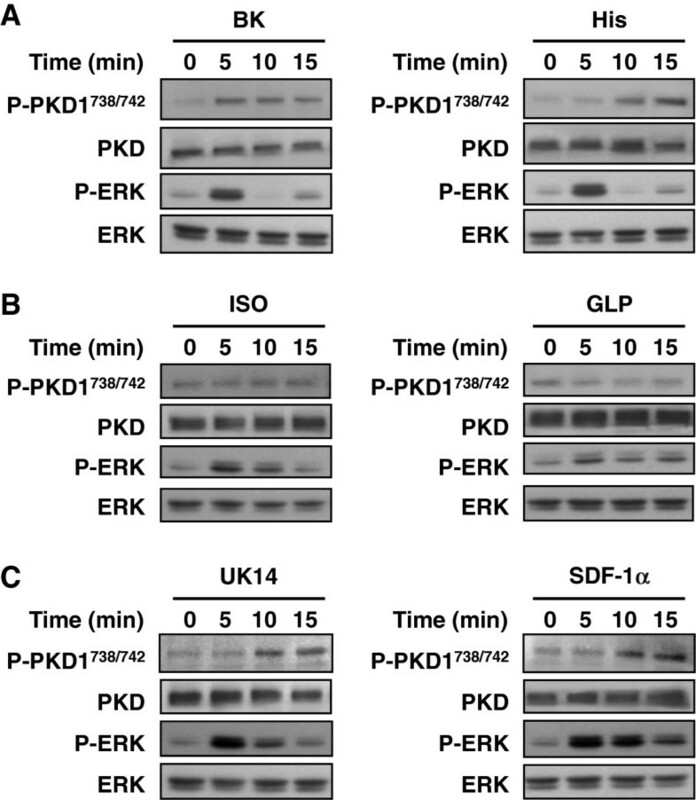 Stimulatory phosphorylation of PKD1, PKD2, ERK and CREB were detected by their corresponding antisera and horseradish peroxidase-conjugated secondary antisera. The immunoblots were visualized by chemiluminescence with the ECL kit (Amersham Biosciences). Antibodies sources are as follows: anti-phospho-PKD1-Ser744/748, anti-phospho-PKD1-Ser916 (also recognize human PKD1-Ser738/742 and Ser910, respectively), anti-phospho-ERK-Thr202/Tyr204, anti-PKD1 were obtained from Cell Signaling Technology (Beverly, MA). Anti-phospho-PKD2-Ser876 and anti-PKD2 were purchased from R & D Systems (Minneapolis, MN). Anti-PKD3 was obtained from Bethyl Laboratories (Montgomery, TX). Jurkat T-cells were serum-starved overnight in the absence or presence of PTX (10 ng/ml) and then washed with Hank’s balanced salt solution (HBSS). Washed cells (1×106 cells/ml) were preloaded with Fluo-4 (AM) followed by incubation at 37°C for 1 h. These labeled cells were then transferred to a black-walled and clear-bottomed 96-well plate (1×105 cells/well) placed in the Fluorometric Imaging Plate Reader (FLIPR), and 50 μl of HBSS (with or without agonists) was added to each well. The resulting fluorescent signals that reflect the intracellular Ca2+ transients were monitored by an excitation wavelength of 488 nm and detection with the emission wavelength from 510 to 570 nm. Transfected cells were lysed in the lysis buffer as described before. Cell lysates were centrifuged (12000 g, 4°C, 5 min) to remove cellular debris. Lysates were incubated at 4°C overnight with M2 affinity gels (20 μl/ sample) for the binding with Flag-tagged Gβ subunits. The resulting immunoprecipitates were collected by centrifugation at 1,000 g, 4°C, for 3 min and then washed three times with 500 μl lysis buffer. Bound proteins were eluted by 50 μl of lysis buffer and 10 μl of 6× SDS-containing sample buffer, and boiled μfor 5 min prior to separation by 12% SDS-polyacrylamide gel electrophoresis (PAGE). Flag-tagged Gβ, HA-tagged Gγ subunits, PLCβ2 and PKD1 in the immunoprecipitates were detected by their corresponding antisera followed with horseradish peroxidase-conjugated secondary antisera in Western blotting analysis. The chemotactic ability of Jurkat T cells was evaluated using transwell plates (Costar, Cambridge, MA) with polycarbonate inserts with 5-μm pores (Costar 3421). Lower chambers were loaded with 600 μl of migration media alone or containing SDF-1α at the concentration of 100 nM. Cells (0.1 ml) at 1 × 106/ml were added to the top chamber of a 24-well transwell (6.5-μm diameter, 5-μm pore size) and incubated for 4 h at 37°C. The cells which passed through the membranes and migrated to the lower chambers were quantified under microscopy. The values shown in each figure represent mean ± SEM from at least three individual experiments. Statistical analyses were performed by ANOVA, followed by the Bonferroni’s post test. Differences with a value of P < 0.05 were considered statistically significant. Previous studies on Gα subunit-induced activation of PKD isoforms were primarily performed on the PKD1 prototype with Gαq[30, 31], leaving the activation profile of the PKD family rather incomplete. Most of these studies employed aluminum tetrafluoride (AlF4−) to elicit G protein-mediated activation of PKD. Although AlF4− can selectively stimulate heterotrimeric G proteins over monomeric GTPases [32, 33], AlF4− activates multiple heterotrimeric G proteins simultaneously and thus cannot be used to identify the specific G proteins involved in the activation of PKD. On the basis of these considerations, we aimed to firstly define the role of different Gα subunits in promoting the activation of all three PKD isoforms. We performed screening on Gα subunit-mediated PKD1 phosphorylation. HEK293 cells were transfected with wild-type (WT) or constitutively active (RC/QL) Gα subunits (Gαq, Gα11, Gα14, Gα16, Gα12, Gα13, Gαi1, Gαi2, Gαi3, Gαz and Gαs) and then assayed for PKD phosphorylation by phospho-PKD-specific antibodies. HEK293 cells have previously been shown to express all three PKD isoforms . The phosphorylation of a pair of highly conserved serine residues in the activation loop (Ser738 and Ser742 in PKD1; Ser706 and Ser710 in PKD2; Ser731 and Ser735 in PKD3) plays a crucial role in human PKD activity . Some early studies on PKD targeted the autophosphorylation sites (Ser916 in PKD1 and Ser876 in PKD2) as surrogate markers of mouse PKD activity, though a recent report has demonstrated that this site is not required for activation . Therefore, anti-phospho-PKD1 Ser744/748 and Ser916 antibodies (also recognize human PKD1 at Ser738/742 and Ser910, respectively) were both adopted for the evaluation of PKD1 activation. As shown in Figure 1, expression of WT Gα subunits did not induce significant PKD1 phosphorylation as compared to the vector control, although expression of Gα11 or Gα14 slightly enhanced the basal PKD phosphorylation. Conversely, prominent phosphorylation of PKD1 was observed in cells expressing one of the constitutively active mutants from the Gαq subfamily (Gαq, Gα11, Gα14, or Gα16). Western blot analysis verified that the expression levels of PKD1 were similar and that both WT and constitutively active Gα subunits were expressed at comparable levels (Figure 1). In contrast, there was no detectable phosphorylation of PKD1 by constitutively active mutants from Gi, Gs, or G12 subfamilies (Figure 1). This is consistent with earlier studies demonstrating that the constitutively active mutants of Gα12 and Gα13 did not induce PKD activation in COS-7 cells . Constitutively active mutants of G q family members stimulate PKD1 phosphorylation. HEK293 cells were transfected with pcDNA3, wild type (WT) or constitutively active (RC or QL) Gα subunits of Gq, G12, Gi and Gs families. Transfectants were then lysed, and proteins were subjected to SDS-PAGE and immunoblotting with antibodies against phospho-PKD1, PKD1, and specific Gα subunits. To examine whether Gα subunits from the Gq subfamily are all capable of inducing activation of all three isoforms of PKD, HEK293/HA-PKD1, HEK293/FLAG-PKD2 and HEK293/Myc-PKD3 stable cell lines were established and then transiently transfected with WT or the RC/QL mutants of Gα subunits (Gαq, Gα11, Gα14, Gα16), followed by in vitro [32P]-kinase assays using syntide-2 as an exogenous substrate for PKD. As shown in Figure 2A, PKD isoforms isolated from all three stable cell lines transfected with vector control or plasmids encoding the WT Gα subunits exhibited low catalytic activity. In contrast, those immunoprecipitated from stable cell lines overexpressing a constitutively active mutant displayed marked increase in PKD kinase activity. Comparable expressions of Gα subunits and PKD isoforms in the various transfectants were confirmed by Western blot analyses (Figure 2B). We also examined the phosphorylation of specific PKD isoforms in the same samples. Since anti-phospho-PKD1738/742 exhibits some cross-reactivity with PKD2 and PKD3, anti-phospho-PKD1910 was also employed to detect PKD1 phosphorylation. Likewise, anti-phospho-PKD2876 was used for PKD2. As PKD3 lacks the phosphorylation site equivalent to phospho-PKD1910, only the phosphorylation at PKD3731/735 was monitored. In agreement with the results from the in vitro kinase assay, stimulatory PKD phosphorylation for all three PKD isoforms was enhanced in the presence of constitutively active Gα mutants from the Gq subfamily (Figure 2B). Unlike members of the Gq subfamily, constitutively active Gαi1 failed to stimulate the kinase activity of all three forms of PKD (Figure 2A) or elevate their level of phosphorylation (Figure 2B). Similar results were obtained with other members of the Gi (Gαi2, Gαi3, GαoA, Gαz, Gαt1, and Gαt2), Gs (GαsL and Gαolf) and G12 (G12 and G13) families (Additional file 1: Figure S1 and Additional file 2: Figure S2). Collectively, these results demonstrated that PKD1, PKD2 and PKD3 can be specifically activated by the constitutively active Gα subunits from the Gq family, but not by those of Gi, Gs or G12 families. All Gα subunits from the G q subfamily can activate PKD1, PKD2 and PKD3. (A) Stably expressed and epitope-tagged PKD isoforms were immunoprecipitated from HEK293 cells transiently co-transfected with Gα subunits, and syntide-2 phosphorylation assays were carried out as described under “Materials and Methods”. Results are the average of at least three independent experiments, and presented as fold of control (±S.E.M.). (B) Cell lysates from HEK293 transfectants as described in (A) were subject to Western blot analysis using antibodies against specific Gα subunits (except anti-Gαq which cross reacts with Gα11), phosphorylated PKD isoforms, PKD1, 2, 3 as well as their corresponding tag. Similar results were obtained in three separate experiments. The preceding experiments suggest that the Gα subunits from the Gq family contribute to elevated PKD phosphorylation. To examine in more detail the stimulation of PKD by G protein signaling, we tested different Gq-, Gs- and Gi-coupled receptors for their ability to activate PKD1 in HEK 293 cells. HEK293 cells were transfected with the Gq-coupled bradykinin BK2 receptor (Figure 3A), Gs-coupled β2-adrenergic receptor (Figure 3B) or Gi-coupled fMLP receptor (Figure 3C), and the transfectants subsequently examined for agonist-induced PKD1 activation. Phosphorylation of CREB or ERK was simultaneously monitored as positive controls of Gs- and Gi-signaling, respectively. 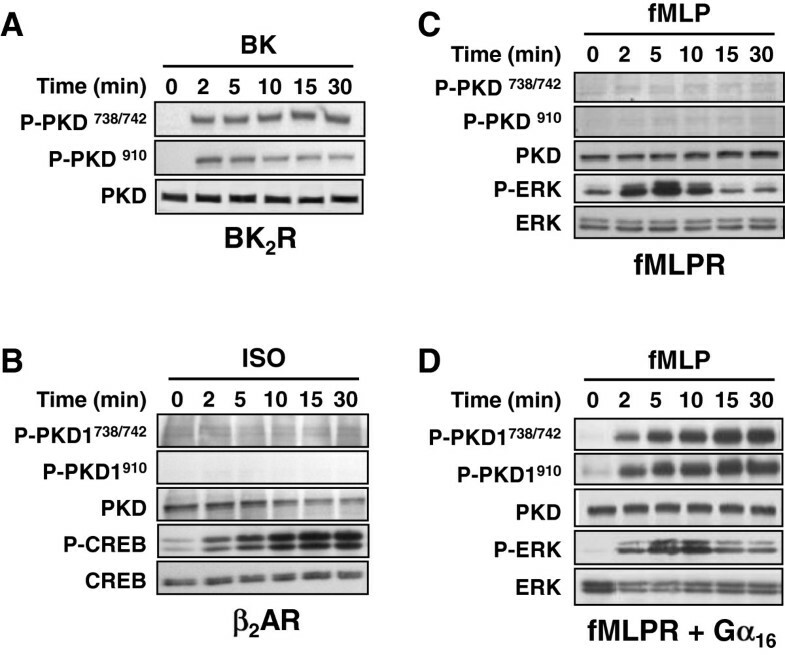 In line with the data in Figures 1 and 2, only bradykinin (which stimulates the Gq-coupled BK2 receptor) rapidly and potently stimulated PKD1 phosphorylation (Figure 3A), while isoproterenol and fMLP failed to induce any detectable PKD activation despite obvious phosphorylation of CREB or ERK (Figure 3B and C). Since many Gi-coupled receptors including the fMLP receptor are capable of interacting with Gα16, it is expected that co-expression of Gα16 would turn on Gq-related signals, thus allowing effective stimulation of PKD1 phosphorylation. As illustrated in Figure 3D, prominent fMLP-induced PKD1 phosphorylations at both Ser738/742 and Ser910 were observed in HEK293 cells co-expressing the Gi-coupled fMLP receptor and Gα16 (Figure 3D); the fMLP-induced response was readily detected by 2 min and was maintained up to 30 min. These results further confirmed the specificity of Gαq-mediated PKD activation and implied that many GPCRs are capable of regulating the function of PKD through members of the Gq subfamily. This may have particular relevance to hematopoietic cells since the promiscuous Gα16 and Gα14 are mainly expressed in immune cells and are capable of recognizing a large number of GPCRs [38, 39]. G q , but not G s or G i signaling is linked to stimulatory phosphorylation of PKD in HEK293 cells. HEK293 cells were stably transfected with BK2R (A), β2AR (B) or fMLPR, in the absence (C) or presence of Gα16 (D). Transfectants were serum starved for 4 h prior to treatment with 100 nM bradykinin (BK), 10 μM isoproterenol (ISO) or 300 nM N-formyl-methionyl-leucyl-phenylalanine (fMLP) for the indicated durations. Cell lysates were resolved in SDS-PAGE, and the presence of ERK, PKD and CREB phosphorylation was detected by their respective anti-phospho or anti-total antisera. Activation of PKD was observed only for BK2R and fMLPR/Gα16 stable cells. CREB activation served as a positive control for β2AR stable cells. Next, we investigated whether PKD phosphorylation can be induced upon activation of Gq-coupled receptors that are endogenously expressed in HeLa cells. Serum starved HeLa cells were treated with various agonists targeting Gq-, Gi- and Gs-coupled receptors for various durations, and PKD1 phosphorylation was determined by Western blot analysis. As expected, bradykinin and histamine acting on Gq-coupled receptors effectively induced a marked increase in PKD phosphorylation at the activation loop (Figure 4A). Agonists that act on Gs-coupled β-adrenergic receptor (isoproterenol) and GLP receptor (glucagon-like peptide) failed to activate PKD, even when stimulatory phosphorylation of ERK was clearly detected (Figure 4B). Unexpectedly, stimulation of Gi-coupled α2-adrenergic receptor (by UK14304) and CXCR4 receptor (by SDF-1α) led to observable PKD activation. This is in contrast to the result presented in Figure 3C where stimulation of the Gi-coupled fMLP receptor in HEK293 cells failed to promote PKD activation. Stimulation of Gq/Gi-coupled receptors activates PKD1 in HeLa cells. HeLa cells were serum starved, followed by treatment with (A) 100 nM bradykinin (BK) or 10 μM histamine (His); (B) 10 μM isoproterenol (ISO) or 100 nM glucagon-like peptide (GLP); (C) 10 μM UK14304 (UK14) or 100 nM stromal cell-derived factor-1 (SDF-1) for the indicated times. Cell lysates were detected for phospho-PKD, PKD, phospho-ERK and ERK with their respective anti-sera. The ability of Gi-coupled receptors to stimulate PKD phosphorylation in HeLa cells was contrary to the results obtained with either GαiQL (Figures 1 and 2) or the Gi-coupled fMLP receptor in HEK293 cells (Figure 3C). Given that Gαq-induced activation of PKD is known to be mediated via PLCβ/PKC , and that Gαi apparently could not activate PKD, we hypothesized that PKD activation by the Gi-coupled receptors in HeLa cells was mediated by the Gβγ subunits, presumably via Gβγ-sensitive PLCβ2 or PLCβ3. Gβγ-induced activation of PKD in HeLa cells have indeed been reported . To test this hypothesis, we first examined the endogenous expression of PLCβ2 and PLCβ3 in both HEK293 and HeLa cells. Western blot analysis revealed that HEK293 cells expressed barely detectable levels of PLCβ2 and PLCβ3, whereas PLCβ3 (but not PLCβ2) was abundantly expressed in HeLa cells (Figure 5A). PLCβ 2/3 is required for Gβγ dimer-induced PKD activation. (A), Expression of PLCβ2 and PLCβ3 in HEK293 and HeLa cells was determined with their respective anti-sera. HEK293 cells were transfected with pcDNA3 and Gβγ dimers with or without PLCβ3 (B) or PLCβ2 (C). PKD activation was detected by specific phospho-antibodies. Results shown are the mean ± S.E.M. of at least three independent experiments. (D) HEK293 cells were transfected with pcDNA3, PLCβ2, Gβγ with or without PLCβ2. Transfectants were lysed and the extracts analyzed by PLC assay or SDS-PAGE together with Western blot using antibodies against phosphorylated PKD1. Band intensity was quantified by Image J software (National Institute of Health, Bethesda, MD, USA) and depicted in graphical form, and presented as a fold-induction of the pcDNA3 control. Results shown are the mean ± S.E.M. of at least three independent experiments. (E) HeLa cells were transiently transfected with HA-tagged PKD1 together with vector control or Gβγ dimers. The expression of PKD1, FLAG-Gβ, HA-Gγ and endogenous PLCβ3 were detected with their specific antibodies. To determine the importance of Gβγ-sensitive PLCβ2/3 in Gβγ-mediated PKD activation, HEK293/Gγ2 stable cells were transiently transfected with FLAG-Gβ1–2, in the absence or presence of PLCβ2/3. Because consistent expression of Gγ subunits (~6 kDa) is more difficult to achieve in transient transfections, HEK293 cells stably expressing Gγ2 were employed in these assays. As expected, co-expression of various combinations of Gβγ alone did not induce any stimulatory phosphorylation as compared to the vector control in HEK293 cells (Additional file 3: Figure S3A). Upon co-expression with PLCβ3, however, both Gβ1γ2 and Gβ2γ2 markedly enhanced the level of PKD phosphorylation; the expression of PLCβ3 alone had no significant effect on PKD phosphorylation (Figure 5B). Likewise, co-expression of Gβ1γ2 or Gβ2γ2 with PLCβ2 induced significant PKD phosphorylation (Figure 5C). These results not only suggest the crucial role of PLCβ2/3 in Gβγ-mediated PKD activation, but also help to explain the differences in Gi-mediated PKD phosphorylation in HEK293 and HeLa cells. Since the Gγ subunit identity has been shown to affect signaling specificity [24–26], we determined whether other Gβ1γ dimer combinations can effectively induce PKD1 activity in the presence of PLCβ2/3. Hence, HEK293 cells were transfected with pcDNA3 (vector control) and one of the twelve combinations of Gβ1γx dimer, with or without PLCβ2. As shown in Figure 5D (lower panel), transfection of Gβγ dimers alone did not significantly enhance the phosphorylation of PKD1 beyond the vector control. Among all of the Gβ1γx combinations tested, Gβ1γ2, Gβ1γ3, Gβ1γ4, Gβ1γ5, Gβ1γ7 and Gβ1γ10 consistently triggered strong and significant PKD1 phosphorylation upon co-expression with PLCβ2, however, there was no significant change in PKD1 phosphorylation in other Gβ1γx/PLCβ2-overexpressing cells (Figure 5D, lower panel). Comparable expressions of all Gβ1γx combinations and PLCβ2 were detected in the transfectants (data not shown), resulting in elevated levels of IP3 formation (Figure 5D, upper panel) as reported previously . We also tested whether selected Gβ1γx/PLCβ2 combinations can induce in vitro kinase activity of the different PKD isoforms (PKD1-3). In agreement with the Gβ1γx/PLCβ2-induced PKD1 phosphorylation profile, Gβ1γ2/PLCβ2 and Gβ1γ7/PLCβ2 induced significant PKD kinase activity with all three PKD isoforms, while Gβ1γ9/PLCβ2 failed to do so (Additional file 3: Figure S3B). Similar Gβ1γx-mediated PKD activation profile was obtained with PLCβ3 (data not shown). As expected, Gβ1γx failed to induce PKD phosphorylation with PLCβ1 which is insensitive to Gβγ (Additional file 3: Figure S3C). Having demonstrated that certain Gβ1γx/PLCβ2/3 combinations were more effective in triggering PKD activity in HEK293 cells, we asked if similar Gβ1γx selectivity for PKD phosphorylation could be observed in HeLa cells that endogenously express high level of Gβγ-sensitive PLCβ3 (Figure 5A). Due to the relatively low levels of endogenously expressed PKD1 , HeLa cells were transiently co-transfected with cDNAs encoding PKD1 and Gβ1γ2, Gβ1γ7 or Gβ1γ9, followed by serum starvation and subsequent immuno-detection of stimulatory phosphorylated PKD. The results obtained with endogenous PLCβ3-expressing HeLa cells (Figure 5E) were essentially similar to those obtained from the PLCβ2/3-transfected HEK293 cellular background (Figure 5D, lower panel). This further indicates that the identity of the Gγ subunit may confer specificity to Gβγ-mediated PKD phosphorylation. It has previously been suggested that Gβγ activates PKD through direct interaction at its PH domain . However, overexpression of Gβγ dimers failed to stimulate PKD phosphorylation in HEK293 cells (Figures 5B-D and Additional file 3: Figure S3A-B) unless Gβγ-responsive PLCβ2/3 was co-expressed (Figures 5D and Additional file 3: Figure S3B-C). Despite the fact that all of the functional Gβ1γx dimers tested are capable of stimulating PLCβ activity , only certain Gβ1γx dimers (e.g. Gβ1γ2) effectively stimulated PKD phosphorylation in the presence of PLCβ2/3 (Figure 5D, lower panel). Hence, we hypothesized that the presence of PLCβ2/3 may allow specific Gβγ to associate with PKD. For this, HEK293 cells were transiently transfected with pcDNA3 (vector control), Gβ1γx (Gβ1γ7, Gβ1γ9) with or without PLCβ2. FLAG-tagged Gβ1 was immunoprecipitated from the lysates of the transfectants, and the immune complexes were subjected to SDS-PAGE, followed by Western blotting for any PKD co-immunoprecipitated with Gβ1. As shown in Figure 6, phosphorylated PKD1 was clearly detectable in the immunoprecipitates prepared from transfectants expressing both Gβ1γ7 dimer and PLCβ2, but not when PLCβ2 was absent. 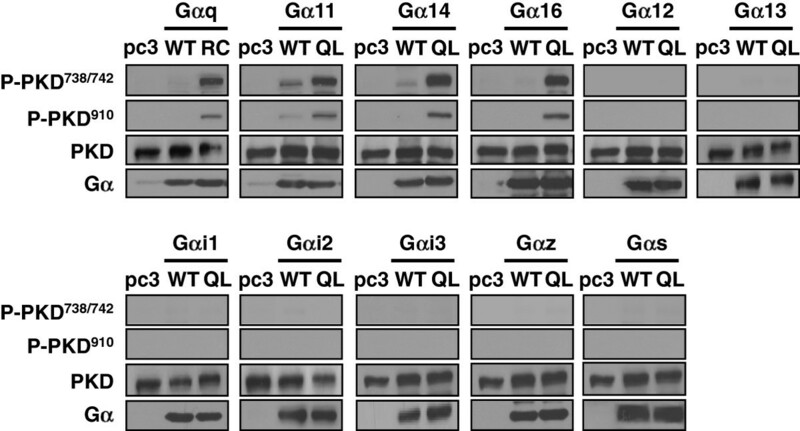 Despite comparable expressions of the various constructs (Figure 6, right panel), hardly any PKD1 was pulled down by the FLAG-tagged Gβ1 in cells expressing Gβ1γ9 with or without PLCβ2 (Figure 6, left panel). It should be noted that both Gβ1γ7 and Gβ1γ9 were able to interact with PLCβ2 in a comparable manner because the latter was detected in the immunoprecipitates (Figure 6, left panel). As the current data showed that Gβγ dimers alone are ineffective in the co-immunoprecipitation with PKD, hence, our findings not only demonstrate the crucial role of PLCβ2 for the effective binding between Gβγ dimers and PKD, but also implicate that only specific Gβγ dimers are capable of interacting and activating PKD in the presence of PLCβ2. Gβ 1 interacts with PKD1 in the presence of specific Gγ subunits and PLCβ 2 . HEK293 cells were transiently transfected with pcDNA3, PLCβ2, and different Gβγ combinations as indicated, followed by serum starvation. Cell lysates were subjected to immunoprecipitation by FLAG-tagged affinity gel and SDS-PAGE to resolve for proteins bound to FLAG-Gβ1. Black lines represent positions at which images from the same blot but on different lanes were merged. Having established that PKD1-3 activation is promoted by ectopic expression of certain Gβγ complexes, we investigated whether Gβγ-mediated PKD activation was implicated in Gi-linked biological function. Cell migration  and invasion  represent some of the known cellular functions of PKD. Since Jurkat T-cells express the Gi-coupled receptor CXCR4 and it is responsive to stromal cell-derived factor 1α (SDF-1α) for chemotaxis , it appears to be a good cellular system for this investigation. First of all, we examined whether PLCβ2 and PLCβ3 are endogenously expressed in Jurkat T cells. Indeed, Jurkat T-cells endogenously express both PLCβ2 and PLCβ3 isoforms, with the former being more abundant (Figure 7A). Next, we used PTX (which ADP-ribosylates Gi proteins) to confirm that SDF-1α-induced signaling and chemotaxis in Jurkat T-cells are mediated via Gi proteins. Both SDF-1α-induced intracellular Ca2+ mobilization (Figure 7B) and chemotaxis (Figure 7C) in Jurkat T-cells were completely abolished upon PTX pretreatment. These results imply that CXCR4 utilizes Gi proteins to stimulate chemotaxis and PLCβ-mediated Ca2+ mobilization in Jurkat T cells. The latter response was presumably mediated by Gβγ dimers released from activated Gi proteins [42, 43]. 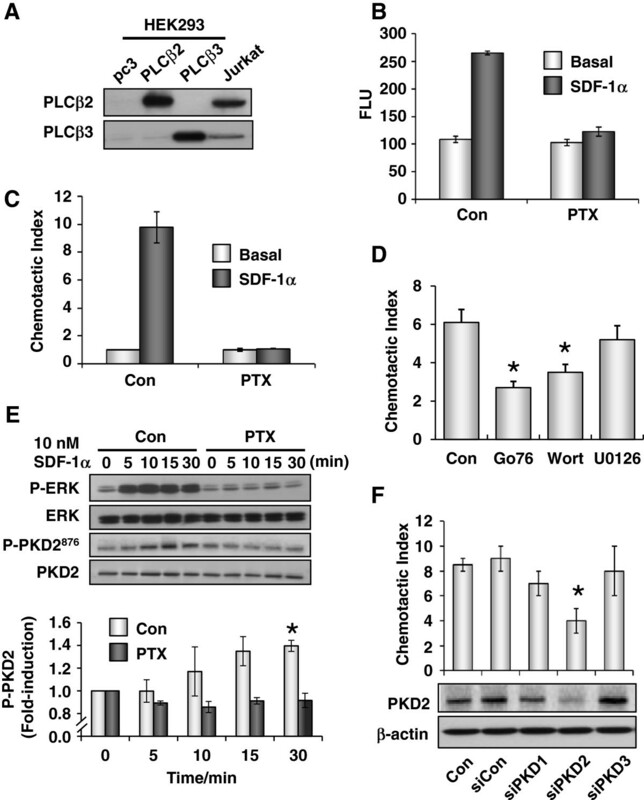 SDF-1α -induced chemoataxis in Jurkat T cells is dependent on PTX-sensitive G i proteins and PKD2. (A) Expression of PLCβ2/3 in Jurkat T cells were examined alongside with parental HEK293 cells or HEK293 cells overexpressing PLCβ2/3. (B) Bar diagram showing maximum SDF-1α-induced Ca2+ mobilization in Jurkat T cells with or without PTX pretreatment. (C) Jurkat T cells pretreated with or without PTX were subjected to SDF-1α-induced chemotactic assay. The chemotactic index was expressed as the ratio of the numbers of cells found in the lower compartments, between the agonist-stimulated and the unstimulated groups. (D) Jurkat T cells were pretreated with or without specific inhibitors for PKD (100 nM Gö6976), PI3K (100 nM wortmannin), and MEK/ERK (10 μM U0126) and then subjected to the chemotactic assay in the presence of SDF-1α. (E) Jurkat T cells pretreated with or without PTX were stimulated with 10 nM SDF-1α for the indicated durations. Cell lysates were subjected to immunoblotting for ERK and PKD2 phosphorylation. (F) Jurkat T cells were transfected with vehicle (RNase free water), scrambled siRNA (siCon), siPKD1, siPKD2 or siPKD3 oligonucleotides for 72 h prior to chemotactic assay. Cells were also harvested and lysates were subjected to Western blot analysis with specific antibody against PKD2. β-actin was used as loading control. To determine whether PKD contributed to SDF-1α-induced chemotaxis in Jurkat T cells, we asked if this chemotactic response can be inhibited by the PKD inhibitor, Gö6976. We were able to demonstrate that SDF-1α-induced chemotaxis could be suppressed by pretreatment with Gö6976 (Figure 7D). In agreement with a previous report , the PI3K inhibitor wortmannin (Figure 7D) also inhibited the SDF-1α-stimulated chemotaxis. Next, we assessed if PKD can be activated by the Gi-coupled CXCR4. Jurkat T-cells were pretreated with or without PTX, followed by SDF-1α stimulation. Since Jurkat T-cells predominantly express PKD2 , only PKD2 phosphorylation was determined. SDF-1α stimulated PKD2 phosphorylation became evident within 10 min and peaked at 15 min after agonist addition (Figure 7E). The response was effectively abolished by PTX pretreatment of Jurkat T-cells. As a control, phospho-ERK was similarly monitored; SDF-1α also stimulated ERK phosphorylation in a PTX-sensitive manner (Figure 7E). To substantiate that SDF-1α-induced chemotaxis in Jurkat T-cells is PKD2-dependent, we used specific validated siRNA oligonucleotides to knock down the expression of PKD2. As shown in Figure 7F, control and scrambled siRNAs had no effect on PKD2 expression, while silencing of PKD2 led to a remarkable reduction in PKD2 expression; siRNAs targeting either PKD1 or PKD3 did not affect the expression of PKD2. The siRNA-mediated knockdown of PKD2 effectively inhibited the SDF-1α-induced chemotaxis, whereas the controls and siRNAs targeting PKD1 and PKD3 did not significantly suppress chemotaxis (Figure 7F). Furthermore, silencing of PLCβ2/3 but not PLCβ1 resulted in the suppression of SDF-1α-induced chemotaxis in Jurkat T-cells, illustrating the importance of Gβγ-responsive PLCβ isoforms in this activity (Figure 8A). As SDF-1α also acts on Gi-coupled CXCR4 receptor in HeLa cells for PKD activation (Figure 4C), we then performed similar knockdown treatment to verify the possible PLCβ2/3-dependency. Our result demonstrated that this Gi-induced signaling also required the Gβγ-responsive PLCβ2/3 isoforms to stimulate the PKD activation (Figure 8B). Requirement of Gβγ -responsive PLCβ 2/3 isoforms in SDF-1α -induced signaling activities in Jurkat T-cells and HeLa cells. (A) Jurkat T-cells were transfected with the vehicle control (RNase free water), scrambled siRNA (siCon), siPLCβ1, or siPLCβ2 and siPLCβ3 oligonucleotides for 72 h prior to chemotactic assay upon SDF-1α treatment. Cells lysates were subjected to Western blot analysis with specific antibody against various PLCβ isoforms. β-actin was used as loading control. *Simultaneous knockdown the Gβγ-responsive PLCβ2 and PLCβ3 isoforms resulted in significant suppression of SDF-1α-induced chemotaxis. (B) HeLa cells subjected to similar PLCβ knockdown profiles were examined for SDF-1α-induced PKD activation, the levels of phospho-PKD1 in cell lysates were detected by Western blot analysis. The fold-induction represents the ratio of band intensities (phospho-PKD1) with respect to the basal (1.00) of the control group. Similar results were obtained in two independent experiments. Extending from prior reports on the regulation of PKD1 by Gq[30, 45], the present study demonstrates unequivocally that each and every member of the Gq subfamily (i.e., Gαq, Gα11, Gα14 and Gα16) are capable of inducing the kinase activity of all PKD isoforms (Figure 2). The ability to β stimulate PKD activity is apparently unique to the Gαq members because other Gα subunits belonging to the Gi, Gs, or G12 subfamilies all failed to induce PKD phosphorylation or kinase activity (Figures 1, 2, Additional file 1: Figure S1 and Additional file 2: Figure S2). However, it should be noted that addition of AlF4− to cells co-expressing PKD and wild type Gα13 can lead to PKD activation . Such an observation is confounded by the fact that AlF4− may activate multiple G proteins simultaneously. The lack of effect on PKD by the constitutively active mutant of Gα13 has in fact been reported . Hence, it is reasonable to conclude that only members of the Gq subfamily are efficiently linked to PKD activation. Despite the preponderance of Gq in mediating GPCR-induced activation of PKD, stimulation of Gi-coupled receptors in HeLa cells resulted in PKD phosphorylation (Figure 4). This may be explained by the observation that HeLa cells endogenously express Gβγ-responsive PLCβ2/3, thereby allowing Gβγ released from activated heterotrimeric Gi proteins to mediate PKD activation through the Gβγ/PLC/PKC axis. One would expect that stimulation of Gi-coupled receptors will result in PKD activation in cells endowed with PLCβ2/3. However, if the endogenous PLCβ2/3 is responsive to Gβγ dimers and all active G protein heterotrimers liberate free Gβγ dimers, then it remains puzzling why stimulation of Gs-coupled receptors cannot activate PKD via PLCβ2/3 (Figure 4B). A recent report has revealed that differential dissociation may exist among different G proteins , though it has long been thought that active G protein heterotrimers readily dissociate into Gα- GTP subunits and Gβγ dimers . Activated GoA heterotrimers can seemingly dissociate more readily than activated Gs heterotrimers, and this may account for Gα-specific activation of Gβγ-sensitive effectors . Alternatively, the lack of Gs-induced PKD activation may be attributed to insufficient release of Gβγ dimers as most Gβγ-dependent signaling appeared to require substantial amounts of free Gβγ, which is most often achieved by stimulating the more abundantly expressed Gi proteins [42, 43]. Another interesting observation in the present study pertains to the requirement of PLCβ2/3 for Gβγ-induced PKD activation (Figure 5). At first sight, our finding seems to suggest a concept different from the previous belief that Gβγ dimers alone can activate PKD through interaction with the PH domain . However, since the cellular model (i.e. HeLa cells) used in Jamora’s report expresses significant amount of Gβγ-sensitive PLCβ2/3, it is possible that the presence of PLCβ2/3 enables specific Gβγ dimers to act on the PH domain of PKD. It has been demonstrated that Gγ prenylation is one of the important factors for Gβγ interaction with PLC isoforms, as the presence of farnesyl lipid motif in Gγ1, Gγ9 and Gγ11 may lead to a weaker PLC activation as compared to Gβγ dimers containing other Gγ components with geranylgeranyl lipid motif . Indeed, we have observed that Gβ1γ1, Gβ1γ9 and Gβ1γ11 are associated with a weaker PLC activation and all of them are incapable of effectively stimulating PKD (Figure 5D and 5E). Hence, the possible influence of Gγ prenylation status cannot be neglected. However, Gβ1γ2 and Gβ1γ3 induce PLC activities of similar magnitude as those of Gβ1γ12 and Gβ1γ13, but only the former two are capable of stimulating PKD. As Gγ2, Gγ3, Gγ12, and Gγ13 are commonly incorporated with the geranylgeranyl lipid motif, factors other than Gγ prenylation and PLC activity may also be important for governing the specificity of Gβγ-mediated PKD activation. It can be observed that only certain Gβ1γ dimers (i.e., those containing γ2, γ3, γ4, γ5, γ7, and γ10) but not others (i.e., those containing γ1, γ8, γ9, γ11, γ12, and γ13) could effectively activate PKD in the presence of PLCβ2/3 (Figure 5D, lower panel). Yet, all combinations of Gβ1γx dimers are capable of activating PLCβ2. The differential ability of various Gβ1γ dimers to stimulate PKD is thus unlikely to solely depend on their PLCβ activity alone. It can also be observed that the expression levels of Gβ1γ4, Gβ1γ7, Gβ1γ9, Gβ1γ11 and Gβ1γ12 appear to be increased upon PLCβ2 co-expression (Additional file 4: Figure S4). However, such increased Gβγ expression is not necessarily related to the subsequent PKD activation, as increased Gβ1γ9, Gβ1γ11 and Gβ1γ12 expressions do not effectively stimulate PKD in the presence of PLCβ2, whereas Gβ1γ2, Gβ1γ3, Gβ1γ5, and Gβ1γ10 trigger the kinase activation without increased levels of subunit expressions (Additional file 4: Figure S4). Hence, Gβγ-mediated PKD activation seems to be a specific function in response to unique Gβγ combinations. In fact, the ability of specific Gβγ dimers to stimulate PKD phosphorylation may depend on their ability to form a complex with PKD, since only those Gβγ dimers that can stimulate PKD (e.g., Gβ1γ7) could be immunoprecipitated with PKD (Figure 6). 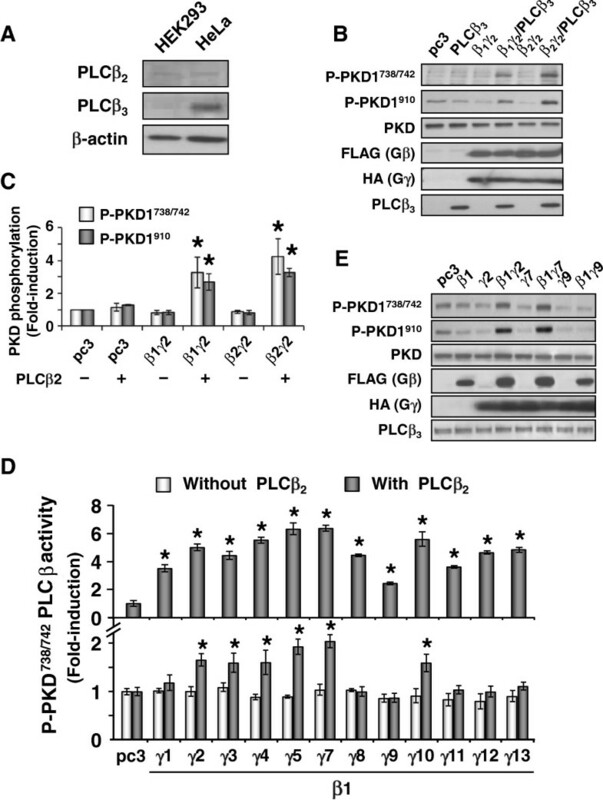 The requirement of PLCβ2/3 in Gβγ-mediated PKD signaling might be explained if PLCβ2/3 is an essential component of the signaling complex that stabilizes the interaction between Gβγ and PKD. The possible existence of a Gβγ/PLCβ2/3/PKD signaling complex is supported by the fact that Gβγ dimers serve as direct activators for PLCβ2/3, probably through the binding of Gβγ to the PH domain of PLCβ2/3, while Gβγ/PKD-mediated Golgi fragmentation can be inhibited by a sequester peptide with identical sequence of the Gβγ-binding PH domain in PKD . Indeed, we have preliminary data suggesting that PLCβ2 can be co-immunoprecipitated with all three PKD isoforms, while PLCβ1 fails to do so (Additional file 5: Figure S5). Apparently the reported capabilities of Gβγ to interact with PLCβ2/3 and PKD seem to support the notion for the formation of a Gβγ/PLCβ2/3/PKD signaling complex. However, it is unclear as to whether a single Gβγ dimer binds to the PH domains of PLCβ2/3 and PKD sequentially or simultaneously. Similarly, we cannot rule out the possibility that there may be different pools of Gβγ dimers for Gβγ-PLCβ and Gβγ-PKD interactions, respectively, and that they may subsequently cooperate with each other to stimulate PKD. Further studies are required to examine the precise interactions between Gβγ, PLCβ2/3 and PKD. The assembly of a Gβγ/PLCβ2/3/PKD signaling complex may require the participation of scaffolding proteins. In this regard PKD isoforms have been shown to interact with the PDZ domains of a scaffolding protein family named NHERF . Coincidently, PLCβ2/3 can also interact with different NHERF members [53, 54]. Hence, NHERF, as well as other similar scaffold proteins, may act as a nexus for Gβγ/PLCβ/PKD signaling (Figure 9), in which intracellular scaffold may facilitate or determine the formation of functional complexes among the signaling players. Scaffolding proteins (e.g. NHERFs and others) may form functional complexes with specific PLCβ isoforms and PKDs, and perhaps only those complexes containing PLCβ2/3 will enable Gβγ dimers to be recruited for interaction with PKDs. Such activation mechanism is not feasible for PLCβ1 which is Gβγ-insensitive. The Gβγ/PLCβ2/3-induced DAG production leads to confirmation changes of PKDs as well as PKC-mediated phosphorylation on the kinases. As demonstrated in the current report, enhanced Gβγ-induced PLCβ2/3 stimulation alone does not guarantee a successful PKD activation, it is possible that only specific Gβγ dimers (e.g. Gβ1γ2) are compatible with the PH domain of PKDs for productive conformation changes, which result in functional activation of PKDs. In fact, our unpublished data showed that PKD activation triggered by Gi-coupled receptors is sensitive to inhibitors for PLCβ (e.g. U73122) as well as to Gβγ subunit scavengers (e.g. transducin). Since only specific Gβγ dimers are capable of stimulating PKD in the presence of PLCβ2/3, our results actually suggest a dual requirement of functional PLCβ activity and compatible Gβγ dimers for Gi-mediated PKD activation. It remains unclear if all the members in the Gq family (i.e. Gαq, Gα11, Gα14, and Gα16) also activate PKD in a similar manner. However, it should be noted that another scaffold protein named PAR3 have been suggested as a Gq-specific signaling component with selective recruitment of PLCβ1, while PLCβ2/3 isoforms may have high preferences towards NHERF members in Gi-mediated signaling [53, 54]. The involvement of different scaffold proteins may also explain the differential observation that, Gα subunits of the Gq family (much stronger activators for PLCβ isoforms as compared to Gβγ dimers) are capable of stimulating PKD in a Gβγ-independent manner. A schematic diagram for the Gβγ -mediated PKD activation. PLCβ2/3 serves as important intermediates for the Gβγ-mediated PKD activation, in which intracellular scaffold proteins may facilitate or determine the formation of functional complexes among these signaling players. Scaffold proteins (e.g. NHERFs and others) may form functional complexes with specific PLCβ isoforms and PKDs, only those complexes containing PLCβ2/3 will enable Gβγ dimers to be recruited and interact with PKDs. The Gβγ/PLCβ2/3-induced DAG production leads to confirmation changes of PKDs as well as PKC-mediated phosphorylation on the kinases. As demonstrated in the current report, enhanced Gβγ-induced PLCβ2/3 stimulation alone does not guarantee a successful PKD activation, it is possible that only specific Gβγ dimers (e.g. Gβ1γ2) are compatible with the PH domain of PKDs for productive conformation changes, which result in functional activation of PKDs. Such activation mechanism is not feasible for PLCβ1 which is Gβγ-insensitive. PKD mediates a diverse array of normal biological functions and pathological activities, including cell proliferation and differentiation, cell motility, regulation of cell vesicle trafficking, secretion, and polarity, inflammatory responses, cardiac hypertrophy and cancer . Therein, the transport of protein from the Golgi to plasma membrane is regulated via Gβγ signaling [27, 28, 56]. From our results, it is postulated that stimulation of Gi-coupled receptor leads to the liberation of free Gβγ dimers, which then interact with PLCβ2/3 and activate PKD. This may help to elucidate part of the mechanism regarding secretory activities regulated by receptor-induced Gβγ translocation between the Golgi and plasma membrane , and the characteristic of Golgi as one of the major cellular locations for activated PKD . Indeed, Gβγ dimers are known to mediate many cellular responses and signaling pathways involved in multiple aspects of cellular function. Previous studies have reported that SDF-1α-induced activation of CXCR4 receptor induces chemotaxis in Jurkat T cells . Here, our results showed that this Gi-coupled chemotactic response may be mediated by the Gβγ/PLCβ/PKD axis (Figure 7). However, further investigations are needed to determine whether these components act in concert. The activation of STAT3, which is an important transcription factor, is also regulated by Gβγ-mediated signaling . Similar to PKD, only distinct combinations of Gβγ can effectively activate STAT3. Nevertheless, the panel of STAT3-activating Gβγ dimers is not identical to the PKD-stimulatory Gβγ complexes; only Gβ1γ4 and Gβ1γβ7 are effective activators for both pathways. Taken together, our results suggested that PKD may be implicated in diverse cellular activities, including those mediated by Gβγ. Functional redundancy is a common feature among isoforms of biological molecules. However, it is not always the case. Though the three PKD isoforms are highly conserved and our results showed that all three PKD isoforms (PKD1, PKD2 and PKD3) are activated equally well by Gα subunits from the Gq family, as well as by specific Gβ1γx with PLCβ2/3, they may have unique functions. For example, PKD1 plays a non-redundant role in pathological cardiac remodeling, and the homozygous germline deletion of PKD1 causes embryonic lethality . As for PKD2, it has a unique role in endothelial cells , lymphoid cells , and monocytes . Recent studies have revealed the essential role of PKD3 in the progression of prostate cancer  and insulin-independent basal glucose uptake in L6 skeletal muscle cells . Further studies are necessary to elucidate the mechanisms behind GPCR-mediated activation of the three PKD isoforms. Collectively, among various members of G proteins, only the Gα subunits of the Gq family effectively activate all three PKD isoforms (PKD1/2/3), while Gα subunits of other G protein families (Gs, Gi, and G12) are inefficient in these kinase activations. However, receptors linked to Gi proteins are capable of triggering PKD activation in cell lines endogenously expressing (HeLa cells and Jurkat T-cells) or exogenously transfected with (HEK293 cells) Gβγ-sensitive PLCβ2/3 isoforms, indicating the involvement of Gβγ dimers for the Gi-mediated PKD activation. Although the presence of PLCβ2/3 is highly important, only those Gβ1γ dimers with γ2, γ3, γ4, γ5, γ7, and γ10 are effective activators of PKD, and the specific interaction between Gβγ, PKD and PLCβ2/3 may play a pivotal role in this Gβγ-mediated PKD signaling pathway. 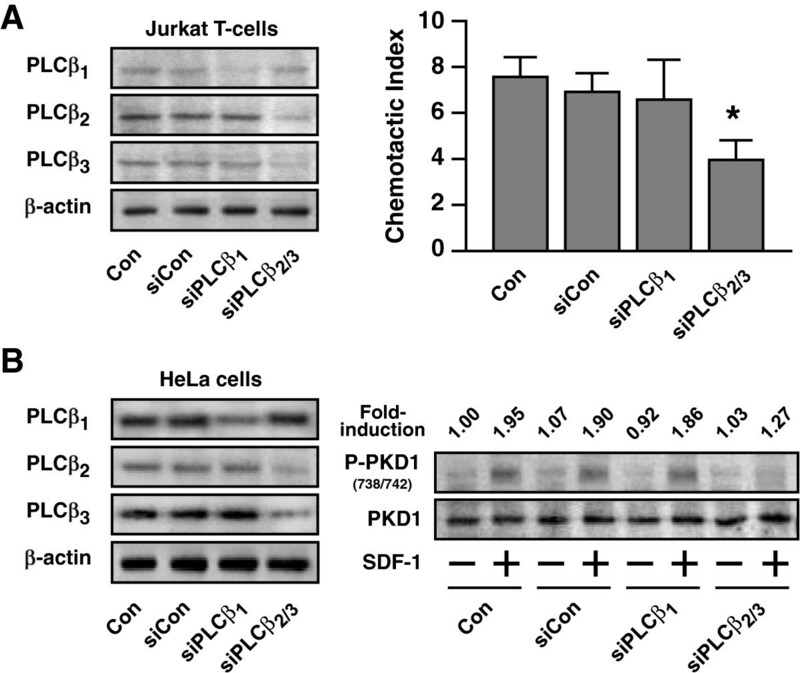 Furthermore, the biological significance of Gi-mediated PKD activation is illustrated by SDF-1α-induced chemotaxis on Jurkat T-cells, in which the chemotaxic activity is abolished by pretreatment with PTX and knockdown of PKD. Taken together, our current report illustrates that Gβγ dimers from Gi proteins may activate PKD in a PLCβ2/3-dependent manner, and the identity of Gγ of the Gβγ dimer being a determinant. Winnie WI Lau, Anthony SL Chan contributed equally to this work. We thank Drs. J. Van Lint, Q. J. Wang, and Dr. R. Ye for the provision of cDNAs. Supported by the Hong Kong RGC (HKUST 660107, 660108, 660109), UGC (T13-607/12R), and the Hong Kong Jockey Club. WWIL and ASLC carried out the experiments participated in the design of the study and wrote the manuscript. LSWP and JZ carried out some of the experiments. YHW participated in the design of the study and revised the manuscript. All authors read and approved the final manuscript.